John Kasich finished second in New Hampshire. That's terrible for Republicans. 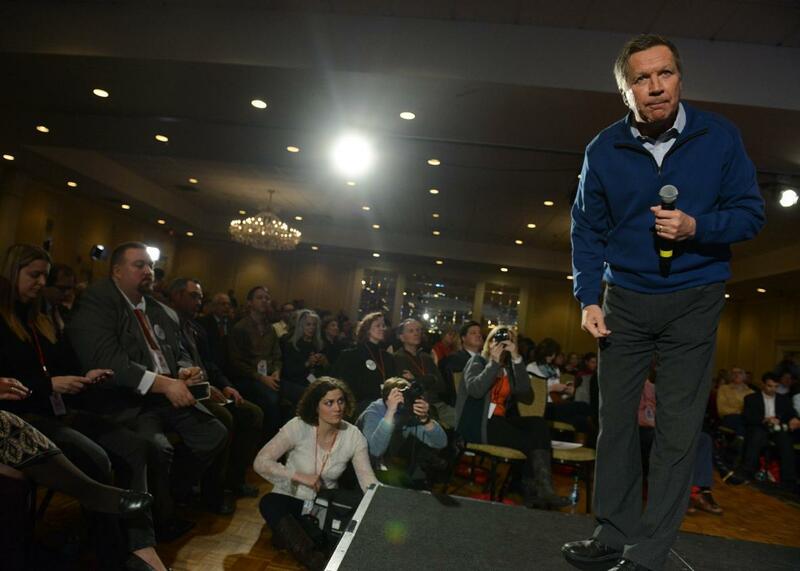 John Kasich speaks at a town hall on Jan. 23 in Nashua, New Hampshire. In the runup to Tuesday’s Republican primary, John Kasich conceded that a poor performance in New Hampshire would mean an end to his campaign. “If we get smoked here,” the Ohio governor told reporters last week, “I’m going home.” But after finishing second place in the Granite State—ahead of Marco Rubio and his two other party-approved rivals—it’s clear Kasich isn’t going home. He’s going on to South Carolina. The problem for the Republican Party, though, is that Kasich is unlikely to go much further than that. In the meantime, he’ll siphon off momentum, media attention, and money from his fellow party-approved rivals who are actually in a position to capitalize on a post-primary bump. Kasich’s surprise showing actually turns the GOP’s Trump-themed headache into a migraine. There were always going to be two narratives coming out of New Hampshire: the major one about Donald Trump, who has been leading in state polls for months, and the minor one about whichever of the establishment-friendly foursome came out on top in the contest within a contest between Rubio, Jeb Bush, Chris Christie, and Kasich. Someone like Marco, or even Jeb, was well positioned to use the second-place spotlight to finally begin consolidating establishment-minded voters, which remains the best and perhaps only path left for any of them to pass Trump and Iowa-winner Ted Cruz later this year. Kasich, though, is almost comically ill equipped to travel that difficult path. For starters, there’s the very real problem that his bank account is running low. He raised only $3.2 million in the final three months of last year and began 2016 with only $2.5 million on hand—about a fourth of what Rubio had in the bank and a third of what Bush did. Yes, Kasich’s performance in New Hampshire will likely come with an uptick in fundraising, but the odds are that he’s still going to have significantly less than Rubio and Bush, not to mention Trump and Cruz. Much of the money he does bring in this week, meanwhile, will be canceled out by the millions Rubio and Bush will now spend via their super PACs to torpedo Kasich’s campaign. Kasich’s bigger problem is just how out of line his (relatively!) moderate worldview appears to be with that of the Republican voters he’ll need to unite. He doesn’t just have a history of going against the conservative line—he has a history of unapologetic conservative apostasy, often seeming to take great joy in telling conservative voters that they’re wrong. In a world where a former reality TV star can win New Hampshire, anything is possible. But in a world where Donald J. Trump does win New Hampshire, it’s hard to imagine a critical mass of Republican voters will be excited about Kasich’s positions on hot-button topics like immigration, Common Core, Medicaid expansion, and marriage equality. The Ohio Republican’s already difficult job will get that much more so now that the race is leaving New Hampshire, a state where the candidate he’s most often compared with, Jon Huntsman, won roughly the same share of the GOP vote four years ago as Kasich did on Tuesday. (Huntsman, you probably won’t remember, dropped out shortly after.) Next comes South Carolina and then Nevada, neither of which will be anywhere near as friendly to Kasich’s particular brand of politics. If he is still standing come March, he’ll then need to survive a Super Tuesday dominated by delegate-rich southern states like Texas, Georgia, and Alabama. In other words, Kasich will leave New Hampshire as a winner—but a winner the race will soon forget. Donald Trump Won New Hampshire. Sad!